Click the button below to go to the article. As we think about the different congregations we have experienced or know in our communities, I think most of us could say that some "flourished" and others did not. But what makes the difference? Professor Joel Thiessen of Ambrose University in Calgary and his team are starting a long term project to better understand congregational flourishing. Now Dr. Thiessen has already done some homework for this project. Specifically he has looked at societal reasons in Canada for the decline of the church and the Christian faith over the past 60 years. His major study was recently published in the 2015 book "The Meaning of Sunday: The Practice of Belief in a Secular Age." I just finished reading it a couple of weeks ago, and it is excellent. He has looked at the religious beliefs and practices of Canadians, who can be categorized into three different groups: those who attend religious services weekly, those who attend services mainly for religious holidays and rites of passage, and those who do not identify with any religious group and never attend religious services. His conclusion is one that many church leaders will affirm: a tsunami of societal change is fostering growing secularization. “Stop blaming churches…. factors beyond what religious groups control significantly account for diminished religious involvement and affiliation.” (Joel Thiessen, The Meaning of Sunday, page 148). But congregations still want to thrive in these challenging times... and there are indeed congregations that are "flourishing" despite the cultural realities in Canada. So this is Thiessen's next task: to describe the nature of congregations that are thriving in our current social context despite the social context. What can we learn from them to help us all? This study will continue for many years, and it is only now beginning. In the meantime I commend it to your attention. It is a VERY rare thing for an academic with a heart for Christ's church to look at Canadian realities with the goal of helping the church. I for one look forward to the gleanings of this research team. What follows is the link to Dr. Thiessen's new blog, and his first post. We’ve all heard it: “20% of the congregants do 80% of the work in a congregation.” Most of us probably believe it’s true. But does it have to be? We’ve all done it: thinking that the recruitment of people for congregational ministry is problem-solving. Filling a position is too easily seen as averting a crisis. But what if engaging people in congregational ministry is primarily about helping people find their faith more meaningful? What if the work of helping congregants find involvement doesn’t just happen when there is an empty chair to fill, but is a core work of a congregation that is going on all the time? Some of the most common concerns I hear about in my conversations with congregations revolve around “member engagement”: congregants who believe they are “active members” but infrequently attend worship, people who attend worship but do not participate mid-week, as well as the hesitancy of people to agree to take on leadership roles in congregational life. It is most acutely felt in many congregations when leaders find it hard to fill important ministry positions on committees, in pastoral care, for church school, as well as on the Session. I wonder if one reason we have these challenges is because we are focused primarily on the needs of the congregational organization rather than nurturing people? On filling an empty chair rather than fulfilling individuals? The big benefit of this program is how it helps a congregation take much more seriously the interests, needs, motivation and point-of-view of congregants as individuals who are being invited not only into new ministry opportunities but also into a faith journey. It is also very comprehensive, as it seeks to align the promoted congregational attitude towards involvement with an organization that is oriented to invite, support and encourage participation. If your congregation feels like it is struggling finding people to fulfill ministries, then this approach and resource may be very helpful to you. If you are interested, drop me a line and I will email this free package to you. Westminster Presbyterian Church in Calgary is now utilizing the Narrative Lectionary throughout the congregation: Sunday worship, church school and in the home. So, to answer your first question, "what is the Narrative Lectionary?" It is a four year cycle of readings that has been imagined and managed by Luther Seminary in the USA. This is what the creators say about the motivation behind this four year old lectionary: "Though the Revised Common Lectionary has united the church in its reading of scripture and has given much-needed structure, it doesn’t present scripture -- especially the Old Testament -- in a way that helps people to become fluent in the first language of faith. The Narrative Lectionary is an attempt to take nine months to do just that." The Frequently Asked Questions page also has a video intro to the overall plan of the Narrative Lectionary. Resources week by week are provided on-line--and free-- at workingpreacher.org. This site, also managed by Luther Seminary, provides both written and audio podcasts on lectionary texts for both the Common Lectionary and the Narrative Lectionary. So how is Westminster using the Narrative Lectionary? The minister hosts a Bible study group weekly on the lectionary texts for the upcoming Sunday. In advance of the goup's meeting participants are sent links to the written and podcast resources for the texts found at WorkingPreacher. Group discussion helps participants delve more deeply into the texts and the insights that arise help shape Sunday's sermon. The church school follows the same texts, so children deal with the same stories as their parents do on Sunday morning. Curriculum materials for the church school teachers are all available on-line for downloading so classes can be prepared. Finally, the picture at the top of this post shows a page from inside the Grade 3 - 6 home guide. 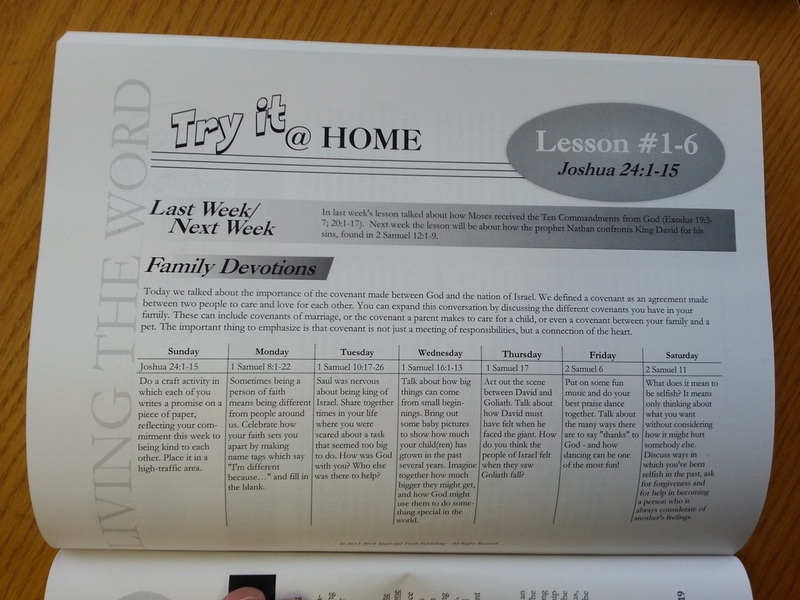 This guide provides texts and suggested activities for daily family devotions. Westminster has been using this lectionary all this year, but in December is introducing it in this far more comprehensive way across the congregation. On November 22nd, Knox Presbyterian Church in Calgary hosted a workshop on Community Hubs that was presented by the Calgary Interfaith Council. The Calgary Poverty Reduction Initiative in its May 2013 report proposed that Community Hubs can be an important means to reduce poverty in the city. The workshop brought people together to explore how their faith communities might participate in--or lead the creation of--a Community Hub. "Poverty is most effectively reduced when people work together in their communities to develop actions that meet their real needs. In recent years community-based multi-service sites termed community hubs have been developed in various cities across Canada as an effective approach to poverty reduction. A community hub is an intentionally designed space that facilitates connections among residents for community building, and for programs and services to support individual and family resiliency in the neighbourhood. "The development of community hubs can serve to build community while bringing services closer to people in their communities and thereby enhance access. In Calgary, the Genesis Centre and several of our Community Resource Centres currently function similar to what is envisioned by a community hub. In order to be effective, community hubs respond to the unique needs of particular communities, so no two may be identical. "The Calgary Poverty Reduction Initiative proposes working with communities to establish a network of community hubs in priority neighbourhoods. Community hubs could provide a variety of programmes and services including childcare, community gardens, mobile health services, civic services, justice services, library services, food trucks, recreation and arts programming, community kitchens, financial literacy, social services, youth and seniors programming, immigration services and Inform Alberta service kiosks. Such centres can also provide local economic development as potential centres of community economic development activity." Faith communities are seen as important potential participants in this initiative. We are communities who have concern for the poor, and are potential pools of volunteers to help create and manage hubs. Also our congregations may have space in our facilities that can be utilized for a hub. For congregations seeking a missional focus and open to partnerships this is an initiative that is worth looking into. Thanks to Knox Church for your initiative in this initiative! - appear to give low personal priority to their faith, and no priority to its development. -- that whole engagement, ultimately, depends on one's individual choice, a congregation (like all organizations) needs to have a culture that promotes engagement's growth. So what does this mean? One purpose of congregational life and the congregation’s culture is to prompt and facilitate the growth of individual engagement: in relationship with God, in lived faith, and participation in faith community. For over a decade the Gallup organization (yes, that’s right: the people who do polling) has been heavily involved in helping congregations strengthen congregant engagement. Not surprisingly, they think an individual’s faith / church involvement can be measured by the answers they give to four central questions. Those questions are provided below, along with the positive answers that indicate engagement. 1. What do I get – spiritually, emotionally, and psychologically? - in my congregation, my spiritual needs are met. 2. What do I give - what valuable contribution can I make? 3. Do I belong - how and where do I fit in? 4. how can we grow - how are we progressing spiritually? The items given in bullet points can form an agenda for congregational development. The more the "climate" of a congregation helps people to experience these qualities of congregational life the more a congregation is doing in order to foster engagement in both faith and participation. - I also have a free resource to help congregations strengthen congregant engagement throughout the whole of congregational life. It was prepared for Jewish congregations. If you want to know more about this important topic just drop me a line. Do You "Manage" or "Engage" Volunteers? If you are not sure what the question is asking then you probably “manage” volunteers. For decades in many congregations volunteer management was the approach. The priority was given to the organizational structure and the primar﻿﻿y focus was on keeping the structure working. Congregations were not all that concerned with the needs, constraints and aspirations of its volunteers. And they didn’t have to be: the Builder Generation was generally agreeable to adapt themselves to the needs of the organization. For example, my mother didn’t think twice about teaching in the Church School every single Sunday for 9 months, year after year. But as society changed so has the realities of volunteering and it became important to “accommodate” the needs of volunteers. But if your congregation has adapted to current realities by simply accommodating then you probably still have a management mindset that focuses primarily on the needs of the organization. Will involvement in this ministry be a way for me to fulfill my own personal aspirations? Will I find this ministry meaningful, satisfying and rewarding? Can involvement in this ministry help me develop a new set of skills? Will this ministry be affirming for me and help me find my place in the congregation? Will I be relegated to doing what I do at work (“I already do enough of that!”), or can I do something that I find completely different, creative and challenging? Will this ministry be a means for self-discovery, self-development, and self-actualization? Will it help me grow in my faith and discipleship? remain in the ministry over time. In other words, the more of these factors that are met the more engaged people will be. Canadian research is showing that we like the idea of volunteering, but we also want to talk about the above needs, concerns and interests in order to tailor our involvement. This is the biggest take-away learning from the research today. But at the heart of congregational life, aren’t these things really our hopes for congregants? Congregations are to be places where people can have their needs met while also be a community in which individuals can contribute from their strengths for the sake of others. We would hope that volunteering in a ministry would be meaningful, fun, satisfying and rewarding… a means for self-discovery, self-development and self-actualization… a way to grow in faith. What the research is telling us is that people want to discuss these things when they are asked to volunteer and achieve these things as they volunteer. What it will take, then, is a movement in mindset away from volunteer management to volunteer engagement. I am currently putting together a growing collection of resources on member engagement. One resource is a three-page summary of some of the most recent findings by Volunteer Canada. Feel free to download this article I’ve written or contact me about the resources I have. I joined worshippers for coffee after the service at a congregation I was visiting on Sunday. The man I sat across from opened a conversation saying, "I attended a leadership workshop you presented ten years ago. Are you still interested in leadership?" I said I was. He told me he conducted a lot of leadership training in the company he used to work for before retirement. "Leadership is all about relationships" he said, "and the leadership relationship moves through five spheres. The first sphere is ignorance." Now, I have to say, that word jarred me. It is a strong, harsh word. As a writer it is not a word I would choose to use--it sounds a mite judgmental. Bill (let's call him that) went on to elaborate on the concept of his first sphere. "When leaders begin to envision change they often do it in a relational vacuum that has ignorance at its center. People in the organization may not appreciate the real significance of what is going on that is prompting a leader to consider change. People may not get the motives for change. But the leader is in the sphere of ignorance as well in the beginning. The leader doesn't know with depth what the people know about the situation, or how people are reacting to a proposed change, or how people might actually improve upon a new direction. For leadership to really happen a leader needs to move everyone--including the leader--beyond the sphere of ignorance. Unfortunately some leaders never do that, ignorance prevails and--consequently--change will rarely take place." "So you seem to be talking about the importance of dialogue in planned change" I said. "Absolutely" he said. "That's the second sphere." I thought a lot about Bill's insight while driving home. When talk of change begins in a church a lot of congregants can go suddenly silent. The culture of respect and kindness--a part of so many congregations--can inhibit people from sharing their thoughts. Also, congregants may not appreciate their capacity and the value of "leading up", through which they can contribute to enhanced planning. They may believe that leadership is meant to be left to office holders. Leaders may also prefer the silence, because they can fear that the alternative might lead to conflict or bruise their self-esteem. But letting the silence continue robs congregational leaders of one of their greatest opportunities dialogue provides to them: the opportunity to learn about people's motives that would favour or disfavour a new initiative. The writer John Maxwell has given leadership a famous, simple definition: "Leadership is influence—nothing more, nothing less." If you don't know about people's motivation for or against a new initiative, then you are missing the fundamental knowledge for influence. In books about congregational leadership there has been virtually nothing said about the importance of motivation for congregational change. This has been our sphere of ignorance. And yet when we think about it, we readily acknowledge that people have to have some motivation if they will pursue any change. And how does one discover the motivation of congregants? By opening dialogue about change in a congregation, making it a leadership priority to discover people's motives for change, so leaders will know how best to express influence. So I now like the idea that the first sphere of the leadership relationship is ignorance. Perhaps using such a strong word will help push us into the next sphere--dialogue--where new directions can be clarified and improved and motivation fostered. Here's to ending ignorance!